Premium gutter systems are the perfect option for adding both beauty and value to any residential, new construction, or commercial building. At Tristar Gutters, we understand the importance of purchasing high-quality gutter products for your building. That is why we offer a wide range of gutter systems, including premium gutter systems. All of our 6″ half round European gutter systems are made in-house, using our half round machine, and can be cut into various sized lengths in order to perfectly fit the specifications of your particular home or building. 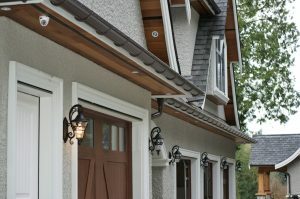 This type of premium gutter system is available in aluminum, copper, steel, and zinc materials and comes with decorative funnels, smooth round downpipes, and decorative pipe straps made from the best heavy-gauge materials on the market. Our half round European gutters are also installed using the strongest heavy-duty brackets on the market to ensure that they provide your home or building with the high level of protection it deserves. LeafPro gutter systems are specifically designed to prevent leaves and other debris from causing clogs in your gutter systems. Through the use of Flo Grip technology, this premium gutter system is able to draw water into the gutter, while also deflecting the windblown debris over the gutter. Any particles that do end up passing through the LeafPro gutters can easily be removed from the drainguard cleanout box. All LeafPro gutter systems are also available in a selection of different materials, styles, and colours, making it easy to find the perfect fit for your specific needs. If you are looking to have premium gutters installed on your home or building but cannot find the right gutter style to match your home’s exterior, we can help. At Tristar Gutters, we have the tools and resources necessary for creating completely customized gutter systems. All of our custom premium gutter systems are available in a wide range of colours, materials, and styles and will be specifically designed to meet your needs. If you would like to learn more about premium gutter systems, or if you are interested in one of our gutter systems or gutter services, please contact Tristar Gutters at 604-533-0500. Our team of Langley gutter professionals would love to help you choose the right premium gutter system for your home or building.